Are sea sponges endangered due to over-harvesting? While it is true that real sea sponges have been in use since the Roman Empire, synthetic alternatives made primarily from wood pulp became commonplace by the middle of the 20th century when DuPont perfected the process of manufacturing them. Today, most of the sponges we use are made from a combination of wood pulp (cellulose), sodium sulphate crystals, hemp fibers and chemical softeners. Although some forest advocates decry the use of wood pulp for producing sponges, claiming that the process encourages logging, the manufacture of cellulose-based sponges is a pretty clean affair. No harmful byproducts result and there is little waste, as trimmings are ground up and recycled back into the mix. Another common type of artificial sponge is made of polyurethane foam. These sponges excel at cleaning, but are less ideal from an environmental perspective, as the manufacturing process relies on ozone-depleting hydrocarbons (set to be phased out by 2030) to blow the foam into shape. Also, polyurethane can emit formaldehyde and other irritants and can form cancer-causing dioxins when incinerated. Some real sea sponges are still sold today, used for everything from cleaning car and boat exteriors to removing make-up and exfoliating the skin. The product of at least 700 million years of evolution, sea sponges are among the world’s simplest living organisms. They survive by filtering microscopic plants and oxygen from the water, growing slowly over many decades. Commercially, they are prized for their natural softness and resistance to tearing, and their ability to absorb and discharge large amounts of water. Scientists know of more than 5,000 different species, though we only harvest a handful of them, such as the exfoliating Honeycomb (Hippospongia communis) and the silky smooth Fina (Spongia officinalis). 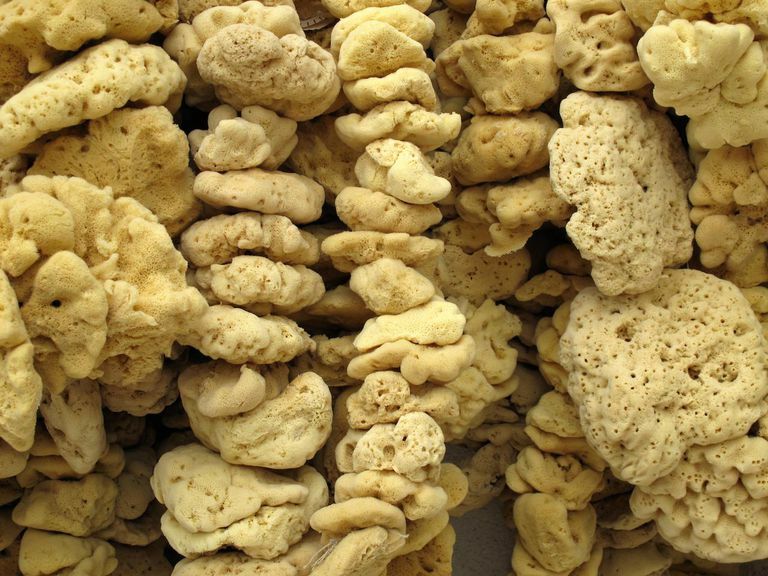 Environmentalists are concerned about protecting sea sponges, especially because we still know so little about them, particularly with regard to their potential medicinal usefulness and their role in the food chain. For example, researchers are optimistic that chemicals emitted from some living sea sponges could be synthesized to create new arthritis treatments and possibly even cancer fighters. And sea sponges serve as the primary food source for endangered hawksbill sea turtles. Shrinking amounts of natural sponge could push the prehistoric creature over the brink to extinction. According to the Australian Marine Conservation Society, sea sponges are under threat not only from over-harvesting but also from sewage discharge and storm water run-off, as well as from scallop dredging activity. Global warming, which has been increasing water temperatures and altering the ocean food chain and sea floor environment accordingly, is also now a factor. The organization reports that very few sponge gardens are protected, and is advocating for the creation of marine protected areas and more sensitive fishing methods in regions where sea sponges remain abundant. How did Astroturf Become so Popular?